« Legal recreational marijuana to be sold at our front door? Asbury Park officials favor the plan according to the Asbury Park Press. Qoaster Quotes: Another boutique hotel to be built in Asbury Park. How many more will Ocean Grove get? Kinmouth Building in A. Park, site of a new hotel to be constructed there. Internet photo. Today, the Qoaster reports that a new hotel will be constructed in downtown Asbury Park on Cookman Avenue. It will have over 100 rooms, and off street parking will be provided nearby on Mattison Avenue. Sackman Enterprises, the owner of #60 Main Avenue in OG is the developer. That building in the Grove appears to be empty now. 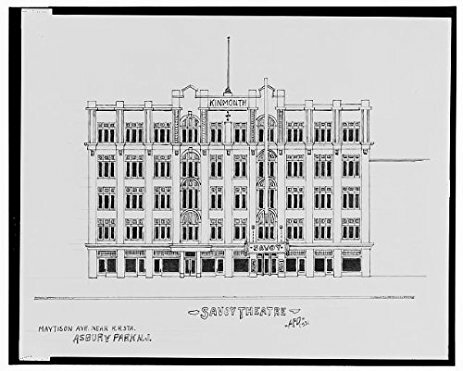 The new hotel in AP will be in the Kinmouth Building which used to house the Savoy Theater. According to the OG Chamber of Commerce, there are 21 Inns and Hotels in the Grove, but only 6 have the word “hotel” in their title. There are two reasons why there is growing interest in boutique hotels on both sides of Wesley Lake. One is because the Camp Meeting Association is concerned about places to stay for their growing numbers of religious tourists. They have ambition to grow their programs including more year round activities. In addition to places to stay for tourists, they are also worried about parking, so what’s new? And then, of course, there is the accelerating popularity of Asbury Park where many people come to visit restaurants, bars, friends, parties, etc, year round, and they also need places to stay. Already, those folks fill up the motels in the area on weekends, including in Neptune and nearby towns. Then consider the Warrington Hotel, which was destined to receive approval for a boutique hotel on the banks of the Retention-Detention basin, until it burned down late 2016. Currently there is a law-suit pending where the owner wants permission to receive approvals to do the planned hotel, even though zoning requires that single family homes now be placed at that site, as occurred after the Manchester fire. But how many new hotels can this area accommodate? The 16 story building going up near the Ocean in A. Park will contain a hotel.